Not an ink test: Diamine Blue-Black. Just a transcript this time, because I am too exhausted from schoolwork. Something a little different today. My Sheaffer Prelude is one of my few medium-nib pens. It allows the ink to shine a bit more, & this ink deserves it. 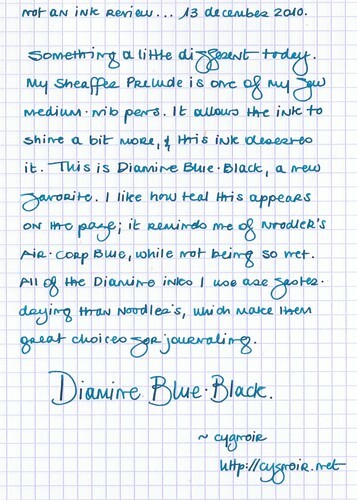 This is Diamine Blue-Black, a new favorite. I like how teal this appears on the page; it reminds me of Noodler’s Air-Corp Blue [sic], while not being so wet. All of the Diamine inks I use are faster-drying than Noodler’s, which make them great choices for journaling. Materials used: Diamine Blue-Black ink, Clairefontaine grid spiral notebook (14.8 x 21cm), Sheaffer Prelude fountain pen. The Noodler’s ink I mention is actually called Aircorp Blue-Black. ‹ PreviousNot an ink test: Noodler’s FPN Dumas Tulipe Noire. Oh wow — Holidailies has led me to your site and opened up a flood of memories. When I was in college I bought 8 little bottles of colored inks and loved the look of them as much as using them. I haven't used a fountain pen in years, but I love them, too. I am going to read your recommendations and maybe give myself a Christmas present. That's wonderful, Janice! Let me know if I can answer any questions for you. And welcome to cygnoir.net. You are my first Holidailies commenter.